Pictured clockwise from top left: Ella Jarman-Pinto; Janet Oates; Kate Marlais; Lisa Robertson; Rose Miranda Hall; Sarah Lianne Lewis. 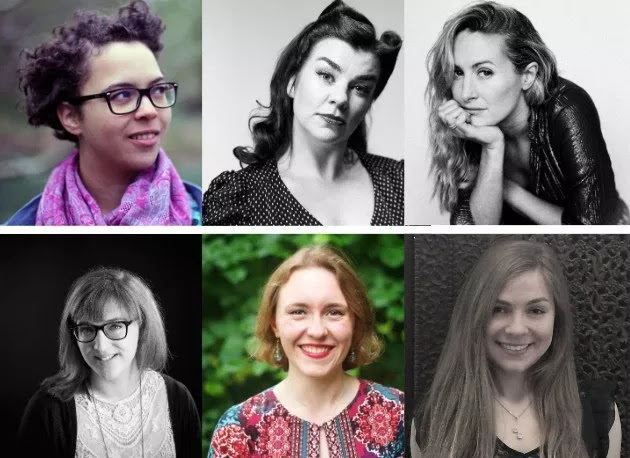 Six composers from across the UK have been selected take part in Wild Plum Songbook, a new career development initiative from Wild Plum Arts, artistic director Lucy Shauffer, in partnership with the Performing Rights Society and the Cheltenham Music Festival. Composers Ella Jarman-Pinto, Janet Oates, Kate Marlais, Lisa Robertson, Rose Miranda Hall and Sarah Lianne Lewis will take part in practical workshops where they will receive feedback from composers Joanna Lee and Errollyn Wallen, as well as the opportunity to have their works recorded by mezzo-soprano singer, Rachael Lloyd and pianist Lana Bode. Further details from the Wild Plum Arts website.